May 3, 1951, a series of new regular postage Liechtenstein stamps were issued, replacing the landscape definitive stamp issues of 1944-1949. 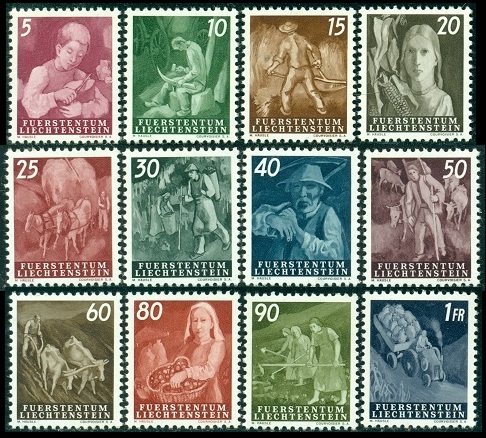 These new definitive postage stamps featured Liechtenstein occupations, and they are all shown above (Sc. #247-58). 05 Rp. - Boy cutting bread. 15 Rp. - Cutting hay. 20 Rp. - Harvesting corn. 25 Rp. - Load of hay. 30 Rp. - Wine grower. 40 Rp. - Farmer with scythe. 50 Rp. - Cattle raising. 80 Rp. - Woman with potatoes. 90 Rp. - Potato cultivation. 01 Fr. - Tractor with potatoes. The 10 Rp. and 20 Rp. denominations were issued in both sheets and in coils. 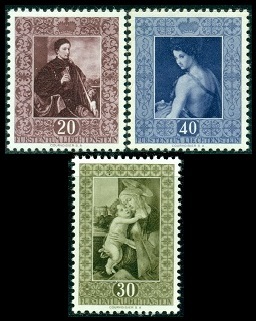 The three stamps shown above (Sc. #B19-21) were issued on July 24, 1951. They feature rare paintings in the Principality of Lichtenstein Art Gallery in Vaduz. 10 + 10 Rp. - Canal by Albert Cuyp (1620-1691). 20 + 10 Rp. - Willem van Huythuysen by Frans Hals (1582-1666). 40 + 10 Rp. - Landscape by Jacob van Ruysdael (1628-1682). 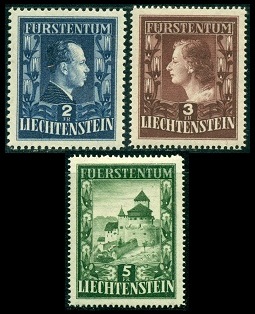 Three new high-denomination Liechtenstein stamps were also issued during 1951 and 1952. The two stamps at the top of the scan above (Sc. #259-60) were issued on November 20, 1951. The 2 Franken denomination has a portrait of Prince Franz Josef II (1906-1989), and the 3 Franken denomination has a portrait of Princess Gina von Liechtenstein (1921-1989). These two high-denomination definitives are watermarked "Crown and Initials" and they come in two different varieties. The first variety is perforated 12 1/2 x 12, and the second variety is perforated 14 1/2. There are also four different orientations of the watermark that exist for both the perforation varieties of each denomination. The 5 Franken high-denomination definitive postage stamp shown at the bottom of the scan above was issued on September 25, 1952. The stamp pictures a View of Vaduz Castle. These stamps were printed in sheets of nine which can be collected as a souvenir sheetlet. 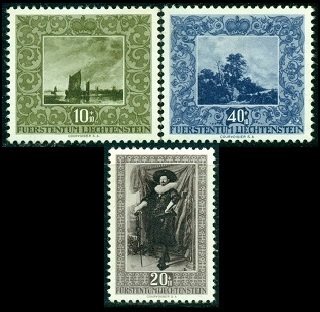 The three stamps shown above (Sc. #261-63) were issued on March 27, 1952. They feature rare paintings in the Principality of Lichtenstein Art Gallery in Vaduz. 20 Rp. - Portrait by Savolodo (1480-1548). 30 Rp. - Madonna by Sandro Botticelli (1445-1510). 40 Rp. - St. John by Andrea del Sarto (1486-1530). The 1949 40 Rp. Church at Bandern issue was re-issued on September 25, 1952. The re-issues were surcharged in Red with a new value, 1.20 Fr., as shown above (Sc. #265).